Reliable is an esteemed producer of an extensive line of garment care and steam cleaning products for both professional and housewares markets, including sewing machines, task lighting, cloth cutters, fabric steamers, steam cleaners, dental and jewelry steam cleaners and ironing and pressing systems. Never heard of 'em? Your local dry cleaner has! And now you, too, can experience the joy of pressing a garment right the first time! And at a price that's fair, too! Steam is the “secret” to getting a clean, crisp and professional finish to your garments. Steam is used to soften the fibers, and the weight of the iron shapes the fabric. This is done effortlessly when you have the right tools to do the job. Made in Europe, using the best components available, when you hold the iron in your hand you’ll appreciate the exceptional quality. 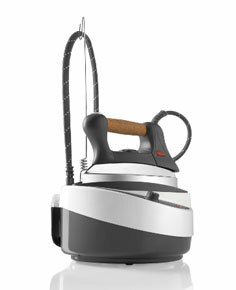 With so much steam available at your fingertips, ironing time is dramatically reduced.